​Wilson Neff Park - constitutes the "town square" of which most of the community's remaining businesses surround. Maintained and well-manicured year-round, the park includes a playground and is the setting for all of Glen Elder's annual community events. Statue of Liberty - The symbolic statue is the centerpiece of the park. Lady Liberty was donated to the city in 1950 by Emily Slaven. 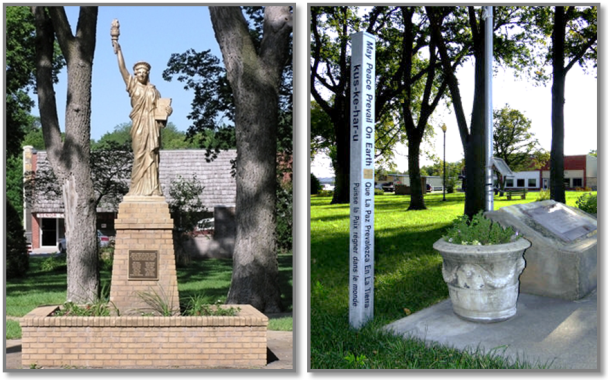 ​Glen Elder's American Legion and Auxiliary, Post #143, worked together to provide the funds for the base of the statue. Peace Pole - The SV24 Alliance traces the settlement of the Solomon Valley to the post-Civil War search for peace, and in this spirit the Alliance elected to place a Peace Pole in the heart of the Solomon Valley to mark Kansas’ 150-year observance. Glen Elder accepted this honor with the monument being placed in the north side of the park. 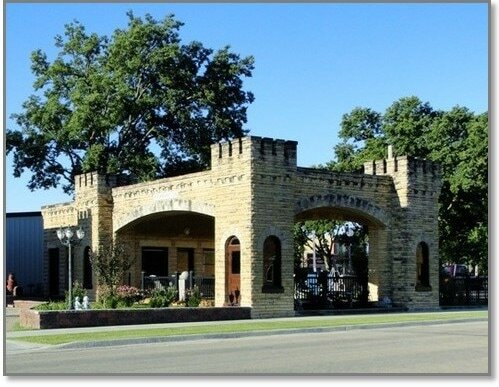 ​Located east, across the street from Glen Elder’s town square, the Castle Service Station was built by Ernie Norris in 1926. This unique structure, a National Historic Landmark, was the result of a dream Mr. Norris had had since being in the military during World War I -- constructing a service station that resembled a castle he'd observed in Luxemburg. Well-built with cut-to-fit, native limestone stone, the building features three spanning archways. Now a home residence, the castle still holds a place in Glen Elder history as a reminder of a man who served his country during the First World War and returned to his hometown for the betterment of the community. Glen Elder is the home of Waconda Lake, Glen Elder Dam and Glen Elder State Park & Wildlife Area. The lake, park shores and facilities are located just a quarter mile west of town. The area comprises one of Kansas' most scenic and popular outdoor attractions. Historically, Glen Elder State Park and Waconda Lake, its namesake based on the famous Great Spirit Spring (Waconda Springs,) and the legend of an Indian princess who died at the location. The spring, now covered by the lake, was located near midway between Glen Elder and Cawker City, Kansas. 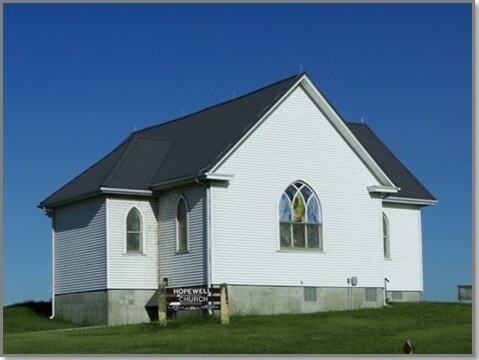 A replica of Waconda Springs can be found just west of the renovated, historic Hopewell Church. ​Both are located just west off KS Hwy 128 after entering the park and passing the ranger station.